MELA NIGHT unifies the skin by night with powerful ingredients to reduce the appearance of dark spots that form mainly at night. Upon waking, the complexion is even and skin blotches are visibly reduced. Glabridin is one of the top 10 leading depigmentation molecules in the world. inhibits the synthesis of melanin by suppressing the activity of 2 key enzymes responsible for its production: TYROSINASE and DOPAchrome Tautomerase. 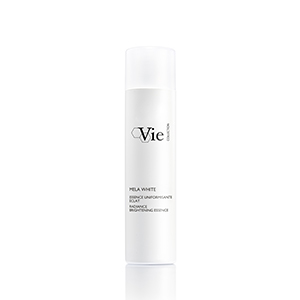 Results: The hyperpigmentation process is stopped, the brightening effect is visible, the complexion is clarified and evened out, and the skin regains its natural transparency. Obtained by aqueous extraction from the licorice root, licorice derivative is known for its strong anti-inflammatory power. It inhibits the production of PGE2, inflammatory molecules responsible for the formation of dendrites and melanin synthesis. Results: Inflammation due to UV is stopped and skin pigmentation is halted. Vitamin E, lipophilic and anti-radical, protects the cells and skin tissues against free radicals and premature aging of the skin by acting as an antioxidant shield. 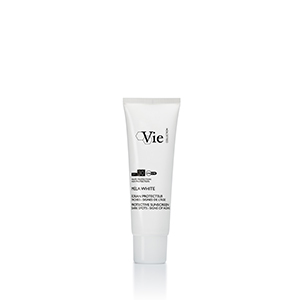 Results: The skin is freed from its dull veil and the complexion is brighter and more even. *Satisfaction test, twice daily application on 24 women for 2 months. Photographs in cross-polarized light. *Scientific test, twice daily application on 24 women for 2 months. A lightweight texturized fluid with an ultra-soft matte finish. Enhanced by moisturizing and soothing ingredients (Vitamin B5, jojoba oil and shea butter), MELA NIGHT ensures comfort throughout the night. A fresh floral notes of jasmine and rose with an aquatic resonance. AQUA (WATER) / EAU, CAPRYLIC/CAPRIC TRIGLYCERIDE, DIPROPYLENE GLYCOL, DIMETHICONE, C10-18 TRIGLYCERIDES, ZEA MAYS (CORN) OIL, DICAPRYLYL CARBONATE, SIMMONDSIA CHINENSIS (JOJOBA) SEED OIL, POTASSIUM CETYL PHOSPHATE, C14-22 ALCOHOLS, GLYCERIN, PEG-40 HYDROGENATED CASTOR OIL, PENTAERYTHRITYL TETRAISOSTEARATE, METHYL METHACRYLATE CROSSPOLYMER, PHENOXYETHANOL, GLYCINE SOJA (SOYBEAN) OIL, BUTYROSPERMUM PARKII (SHEA) BUTTER EXTRACT, PANTHENOL, ACRYLATES/C10-30 ALKYL ACRYLATE CROSSPOLYMER, PARFUM (FRAGRANCE), HELIANTHUS ANNUUS (SUNFLOWER) SEED OIL, C12-20 ALKYL GLUCOSIDE, CHLORPHENESIN, DIPOTASSIUM GLYCYRRHIZATE, SODIUM HYDROXIDE, XANTHAN GUM, MAGNESIUM ASCORBYL PHOSPHATE, DISODIUM EDTA, GLYCYRRHIZA GLABRA (LICORICE) ROOT EXTRACT, SILICA, TOCOPHEROL, DICTYOPTERIS MEMBRANACEA EXTRACT, PANCRATIUM MARITIMUM EXTRACT, SODIUM CITRATE, CI 77491 (IRON OXIDES).